After screening a lot both in real life and on the net, I concluded, that this was one of the best solar cookers in production. Based on a solar evacuated tube, it is able to do reasonable cooking even in days that are largely overcast. It can take quite big cooking volumes (>10L), and on clear sunny days, it is very powerful. I have tested seven different solar cooker models so far, and this one is my favourite. In practice, I only use this one and the Dierkx box cooker. The two are complementary in cooking techniques. For cooking my main meals, I find the BlazingTube to be the best choice. But for cooking whole-grain cereals the Dierkx will do a gentler cooking and leave the grains softer and juicier at the end of the day. Thank you for sharing this with us Josef. I have always wondered how this particular cooker performs. I had seen it on the internet, but never had a chance to see it or use it in person. 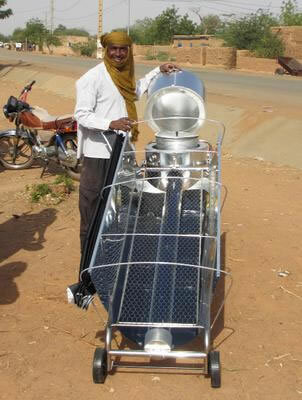 Great to hear your feedback and your opinion on solar cookers you have used.